In general, the first maneuver in evaluating for possible vascular injury in an extremity is the good old physical exam. Is there a pulse or isn’t there? You can then subdivide that into: is the pulse weaker than normal. The problem is, what is “normal?” In most cases, we just compare it to another pulse somewhere and make a subjective judgment. But we love to be more objective about things. Over the years, two simple, noninvasive techniques for evaluating pulses have been developed. The first is the ankle brachial index (ABI) , which was first described in 1930 and was used for diagnosis of peripheral vascular disease in 1950. It is performed by dividing the systolic pressure at the ankle of the affected extremity by the systolic pressure of one of the brachial arteries in the arms. The new(er) kid on the block is the arterial pressure index (API), first described in 1991. This value is calculated by dividing the systolic pressure in the affected extremity by the systolic pressure in the contralateral uninjured extremity. Many trauma professionals use the ABI when evaluating for potential vascular trauma. The typical threshold for pursuing further evaluation is 0.9, and several papers have been published on this topic. The API has also been critically evaluated, and the same threshold is used. However, I believe that the API is more relevant and accurate than ABI. Why? Patients with atherosclerotic disease typically manifest it in their lower extremities. This serves to falsely elevate the ABI to a value greater than 1.0. 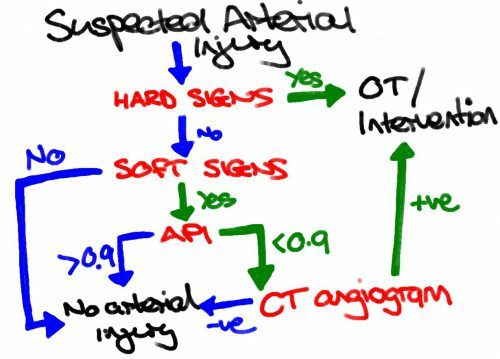 It becomes more difficult to get down to that critical value of 0.9 that might indicate a vascular injury. Thus, the ABI may not detect a true injury, especially one in the lower extremities. The API, on the other hand, relies on the fact that the amount of atherosclerotic disease is usually symmetric between the two lower extremities or the two upper extremities. Thus, the value will not be falsely elevated and will more accurately reflect the presence or absence of a vascular injury. Bottom line: I recommend that you use the API when evaluating extremity vascular injury. Calculate the ratio by dividing the systolic pressure in the injured extremity with the pressure in the contralateral uninjured extremity (if there is one). A value < 0.9 indicates the need for angiographic evaluation, usually by CT scan. Reference: Can Doppler Pressure Measurement Replace “Exclusion” Arteriography in the Diagnosis of Occult Extremity Arterial Trauma? Ann Surg 214(6):737-741, 1991.